Boko Haram kills second kidnapped aid worker in Nigeria: Red Cross - SABC News - Breaking news, special reports, world, business, sport coverage of all South African current events. Africa's news leader. 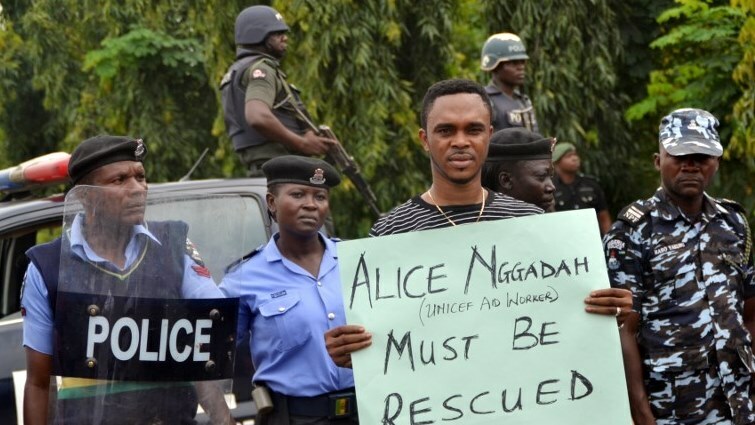 A man holds a placard reading "Alice Nggadah must be rescued", referring to Alice Loksha Nggadah who is one of the three female health workers kidnapped on March 1 by Boko Haram jihadists, during a protest. Islamic State-allied Boko Haram jihadists have killed another kidnapped female Red Cross worker in northeast Nigeria in a “despicable act of cruelty”, the agency said on Tuesday, a month after militants murdered one of her colleagues. Two of the kidnapped women, Hauwa Liman and Saifura Khorsa, worked for the International Committee of the Red Cross (ICRC), while the third, Alice Loksha, worked for the UN children’s agency, UNICEF. The ICRC said on Tuesday it had received information that Liman had been killed by her captors, without giving further details. The government had also earlier announced news of the second killing. “The news of Hauwa’s death has broken our hearts,” ICRC’s Regional Director for Africa, Patricia Danzi said in a statement. UN Secretary-General Antonio Guterres “strongly condemns” the killing, his spokesman said. Guterres also called for the immediate release of the other hostages and for all sides to protect aid workers. Dozens of people gathered in the capital Abuja to mourn Liman. There had been no news of the trio until last month when the ICRC said it had received footage of Khorsa’s killing from the IS-backed Boko Haram faction Islamic State West Africa Province (ISWAP). The ICRC last weekend appealed for their release, underscoring that they were “doing nothing but helping communities” in the conflict-riven region. Nigerian Information Minister Lai Mohammed announced the latest death as a deadline expired and said the government was “shocked and saddened” at the killing, calling it “dastardly, inhuman and ungodly”. He did not initially identify the victim but later added in a tweet that he “commiserated with the family of Hauwa Liman”. “It is very unfortunate that it has come to this. Before and after the deadline issued by her abductors, the federal government did everything any responsible government should do to save the aid worker,” he said. Nigeria’s military and government maintain the Islamist rebels are weakened to the point of defeat but fighters from the IS-backed faction have conducted repeated raids on military bases in recent months. ISWAP split from the faction led by long-time Boko Haram leader Abubakar Shekau in August 2016 in protest at the latter’s indiscriminate targeting of civilians in raids and suicide bombings. Analysts say they believe the switch by militants from attacking “hard” government and military targets to killing hostages is the result of a hardline takeover of the IS-backed faction. This entry was posted on 16 Oct 2018,08:54PM at 8:54 PM and is filed under Africa. You can follow any responses to this entry through the RSS 2.0 feed. Both comments and pings are currently closed.